Excess sugar is responsible for many diseases ( diabetes, obesity in particular) that plague the Western world and are among the leading causes of death . The sugar addiction concerns numerous people and can have serious effects, compare it to the point of addiction to drugs. The excessive concentration and rate of absorption of sugar are such as to unbalance the physiological metabolism : the excess sugar alters the natural balance of the body from the point of view of hormones, metabolism and immune system , replacing our condition equilibrium with an altered state that we come to perceive as normal that never was. The nervous system , connected to the digestive system , indicates the presence of sugar in foods and triggers the release of dopamine. The dopamine (or dopamine ) is an endogenous neurotransmitter in the catecholamine family , produced in different areas of the brain. In particular, it is located in the nucleus accumbens , the part used to motivation and reward mechanism . The excess sugars as well as drug abuse increases the release of dopamine in this part of the brain. The effect is a feeling of gratification / satisfaction and the desire to repeat the experience. 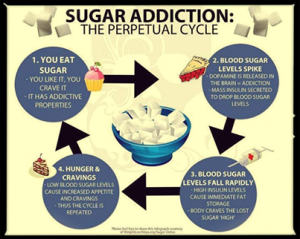 In the case of excess sugar, whipped induced insulin reinforces this vicious cycle can lead to an attitude toward compulsive containing sugar. The intake of sugars , in fact, rapidly rising levels of blood glucose (blood sugar) , and a normal level of blood glucose provides energy to our body, but high levels trigger negative reactions , including increased insulin which is produced by the body to prevent blood sugars reach dangerous levels of toxicity . The increase in insulin , which in turn transforms the sugars extracted from the blood into glycogen which is stored in the liver as an energy reserve , stimulates the production of saturated fats from sugars , favors the accumulation of saturated fat in the adipose tissue , prevents the use of the fat in our body. With the intake of sugars occurs an immediate spike in the amount of insulin , which lowers your blood sugar suddenly , so it appears the sense of hunger , and a vicious cycle begins . Genes and postnatal development directing people toward alcohol, sugar or cocaine. The choice of the object of addiction depends on the experience and personal predisposition .The shortage of sugar often leads to withdrawal symptoms , the symptoms are : anxiety, irritability , lack of concentration , headaches, depression and in some cases even dizziness and fainting . A very common mistake is to think that when it comes to the need for sugar for the body you are referring to refined sugar industry. Refined sugar comes from beets and undergoes numerous chemical processes before arriving at the table , being depleted of its nutrients and minerals , as manipulated by substances such as lime and sulphites . Among the damage caused by the recruitment of refined sugar: helps to quickly raise blood sugar levels, creating massively disrupted glucose - insulin axis , provides calories without nutritional value, significantly unbalance the pH of the blood and that of the oral cavity , causing tooth decay and other disorders and plays a harmful action against the skeletal system. Cases of diabetes are increased from 3 cases per 100,000 people in 8000 about 100,000 people. It has gone from 3.4% to 32% of obese people , which must be added another 33% of overweight people. Until the '70s in Italy consumed 60% of simple sugar purchased in stores , while 40 % came from packaged foods . Today, the proportions were reversed for which it is assumed predominantly sugar content in processed foods, including industry. Very often we do not realize how much sugar is contained in processed foods and especially those intended for children and teenagers . One of the goals they have set themselves nutritionists for 2014 is to reduce by at least a third of the amount of sugar introduced with the feed. The amount of sugar taken daily should not exceed 10% of the total ingested substances. Placing ourselves a target of reducing sugars assumptions , the best approach is to gradually, without abrupt interruption of the consumption of sugar so as not to cause a phase of painful withdrawal symptoms. For most people it is possible to reduce the sugar gradually through self-control . Buy biscuits, cakes , ice cream or yogurt, in versions with smaller amounts of sugars.